Jack Rosenfeld hasn’t seen or heard from his childhood friend Amram Meir since they arrived together at Mauthausen concentration camp in 1945. He has no idea if he is alive. The two men reunite in Teaneck. Rosenfeld and Meir recall their last days together as if they were yesterday. As they walked, they passed a stream, which Rosenfeld recalled was filled with tallitot, tefillin, and bodies. Trudging through the rain, Meir fell to the ground, crying to his friends that he cannot go on. The two brothers – Jack and Marty Rosenfeld – picked up their friend and pushed him forward until they arrived at the camp. “Once you sat down, they shot you in the head,” Rosenfeld said. He remembered thinking that if he were to run into Meir’s parents after the war, he couldn’t stand to tell them that their son had died on the march. Both agree that Meir would have been left behind to die alone if not for the Rosenfelds, who held him up for three days. It was a far cry from the days of their youth, playing soccer in their Hungarian village of HajdÃºdorog, but it was the last memory Rosenfeld had of his childhood friend. That long search was about to come to an end, thanks to some sleuthing by Rosenfeld’s great-nephew. 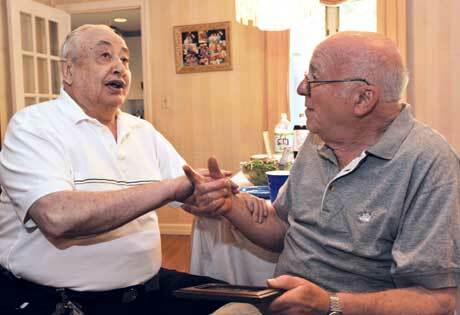 On Aug. 30, shortly after noon, the doorbell rang, and 81-year-old Amram Meir greeted his old friend. The two men, who went through unbelievable horror together, stood face to face, reaching out to embrace one another. Tears and laughter filled Rosenfeld’s home that afternoon as he, his younger brother Joe, and other family members shared stories of some of the darkest days in history. Michael Rosenfeld, center, tracked down his great-uncle Jack Rosenfeld’s old friend, Amran Meir through the Internet. Joe Rosenfeld, who lives in Brooklyn, said that the five Rosenfeld children and Meir did almost everything together. When Germany invaded Hungary in 1944, the Rosenfelds and Meir’s family were eventually sent to Auschwitz, where most of Hungary’s Jews ended up. A twist of fate diverted the two families’ train from the death camp, however, and they ended up in a labor camp in Vienna. Joe, Max, and Abie Rosenfeld remained in Vienna; Jack, Marty, and Amram, who were older, were sent to the Russian front to dig tank traps. From July 1944 until April 1945, the three stayed at the front, with little to cover themselves and their only nourishment a daily plate of water and bread made from what Rosenfeld called sawdust. In the spring of 1945, with the Russian army closing in, the death march to Mauthausen began. Shortly after arriving at the camp, the Rosenfelds found Meir’s father, who had been a doctor in HajdÃºdorog and had delivered all of the family’s children. When liberation came later that year, the two families were sent to different hospitals. While – almost miraculously – both families would survive the war intact, Jack and Amram would not see each other again for more than six decades. Now 82 and a widower with two grown children and a handful of grandchildren, Rosenfeld looks back at the Holocaust scarcely able to believe that humans had been so cruel. The moment Meir walked in on Monday was the culmination of a 65-year-long search that had taken Rosenfeld through the archives of Yad Vashem to a list of phone numbers compiled by a private investigator. None of his research turned up Meir, though, and Rosenfeld feared he might never see his friend again. “It’s a good feeling to see the person after so many years,” he said. The five Rosenfeld brothers and their parents all survived the war, as did Meir’s parents, Morit and Leah, and his sisters, Naomi and Elizabeth. “It’s one in a million” that everybody survived, Rosenfeld said. While Meir and his family went to Israel after the war, Rosenfeld and his family came to America. He and two of his brothers served in the armed forces during the Korean War, after which he received a degree in mechanical engineering. Rosenfeld then spent 30 years working in a factory in the garment center making zippers. Occasionally, he would think about his friend. Not realizing that he now was called Amram Meir (his childhood name had been Imre Mayer), Rosenfeld checked the survivors’ registry through Yad Vashem for the old name. Ironically, both Rosenfeld and Meir ended up providing testimony during the 1990s to Steven Spielberg’s Survivors of the Shoah Foundation, now the University of Southern California Shoah Foundation Institute. Ultimately, it took somebody much younger than the director of “Schindler’s List” to reunite the old friends. Last year, Michael Rosenfeld – Marty Rosenfeld’s grandson – decided to try to find his great-uncle’s old friend, at the behest of his grandmother. After a week of searching the Internet, the now-15-year-old Michael turned up a family tree that led him to a niece, Ruth Szinai-Witty, whom he looked up on the social-networking site Facebook. “There’s such a wealth of information on the Internet; that just amazes me,” said Michael, who shares his Hebrew name, Moshe, with his grandfather Marty, the brother who helped Jack Rosenfeld carry Meir through the death march. Marty Rosenfeld died in the early 1990s. Betting on the uniqueness of Szinai-Witty’s name, Michael sent her a message in November asking if she was the niece of Imre Mayer, son of Morit and Leah Mayer. The next day she replied that yes, that was her family, and she sent Michael a phone number. “It’s like a dream,” Elizabeth Rosenfeld said. At the time, Michael did not realize that his grandfather had also had a relationship with Meir. When Michael told his great-uncle that he had tracked down his long-lost friend, his reaction was a mix of shock and euphoria, Michael said. Meir, who lives in Toronto, has a son, Gadi, who lives in Montclair with his wife and two children. They decided that the next time Meir visited them, he and Rosenfeld would have their reunion. And on Monday, as Michael’s mother stood with her family, beaming with pride, and as Gadi Meir stood with his father, Michael saw the fruits of his labor. Michael’s research also turned up a Swiss bank account in Meir’s father’s name, and, if there’s more than $100 in it, he’ll look into claiming it, Meir joked. “He’s a hell of a kid,” said Jack Rosenfeld. And there they sat in Jack Rosenfeld’s home, surrounded by children and grandchildren eager to see the people they knew only from stories. That generation grew up on stories of their parents’ experiences, and for them, the reunion was a bridge to their past and future. “We always talked about the shochet’s son [Rosenfeld],” Gadi Meir said. For decades after survivors arrived in this country, she said, they tried to assimilate because they felt that society viewed them as outsiders. In recent decades, perceptions about survivors have changed, she said. “It’s gratifying that at this stage in their lives, there’s a recognition that they were heroic,” she said. As Jack and Joe Rosenfeld enjoyed their reunion with Amram Meir, their children spoke about their responsibilities to their parents and their children. 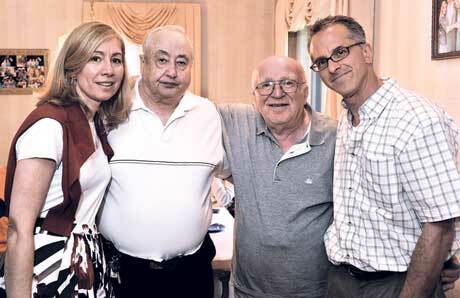 Fern Oppenheim, her father Jack Rosenfeld, Amram Meir, and his son, Gadi. “We always taked about the shochet’s son,” said Gadi Meir. “It’s very gratifying to see families reunited,” said Fern Oppenheim.